"Oooga oooga!" Looking for something completely different and unique? 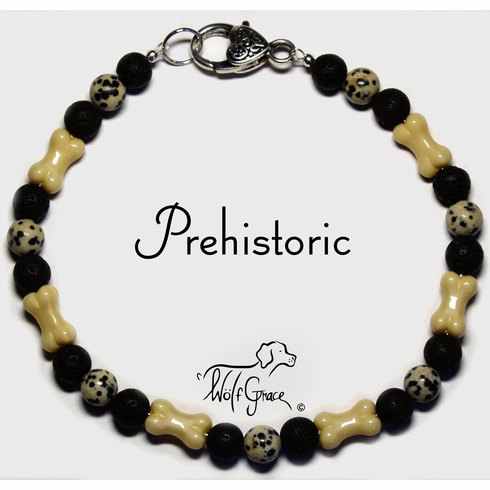 Your dog can wear the neutral earth colors and textures with this Prehistoric vibe necklace! Take a breath of raw simplicity and dress with the down to earth style of prehistorical times. Back when humans and animals roamed free, before we knew the difference between water and fire. It was simpler time. A time of sincere interest, discovery and nature. 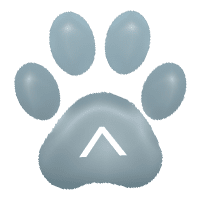 Dogs live by those things daily, as they wiggle and wag their way into our hearts and homes. You will love the interesting natural patterns you find in the 8mm round Dalmatian Jasper! For some added flare and flow, we have added 14.5x8mm Ivory colored 3-Dimensional Bone shaped Czech Glass beads. The unique natural feeling of the 8mm round Lava Rock is an experience of its own kind. Don�t worry, we know they look brittle, but have no fear, we hand select all of our beads, including the lava rock to assure that they are not sharp, jagged or defective in any way. To make sure a caveman doesn�t run off with your necklace, the beads are strung on Sterling Silver jewelry-grade wire. Notice on each end of the necklace, how the Sterling Silver crimp covers reinforce and conceal the Sterling Silver crimps, which hold the beads securely in place.